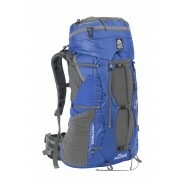 SMALL/MEDIUM TORSO 14 - 18"
LARGE/X-LARGE TORSO 18 - 22"
A great fitting multi-day pack can be the difference between a grueling march and breathtaking adventure. The best multi-day packs are not only lightweight, functional, and durable enough to keep you moving efficiently on the trail, but also fit well. The Granite Gear Lutsen 45 provides comfort and fit innovations, allowing hikers to quickly adjust to a perfect fit, even when on the trail. Besides the convenient ease of adjustability, the Lutsen provides superior load-transfer capabilities to the shoulders and hips. With the Re-Fit system, hikers will be able to go farther, more comfortably. From stretch side pockets and water-resistant zippers & fabrics, to conveniently-placed hydration ports and compression straps, it’s all there. The most important aspect of the Lutsen 45 is the innovative Re-Fit Air Current suspension system, which offers a custom-fit for a wide variety of body types. Custom fitting takes just a few simple steps. Adjusting the hip-belt is as easy as sliding the belt from behind the pack’s ventilated back panel and adjusting the hook-n-loop to match your waist size. Adjusting the torso size is equally as simple. Simply break the hook-n-loop connection and re-align it using the markings that correspond to your torso length. And that’s it, you’re fit! In addition to having a pack that boasts world-class materials, construction and design, you have a pack that’s sized specific to you.